The Manitoba Child Care Association is still waiting for the province to announce a multi-year child care strategy that reflects public, parent, and business leader opinions. All agree the shortage of spaces is a serious issue. As of July 31, 2017 there are 16,568 children on the online child care registry waiting list. That is an increase of 1,910 in 2017. Parents report a 14 – 15 month wait on average for a licensed child care space. 41% have delayed a return to work, 30% have turned down a job, and 24% have turned down an educational opportunity because they lacked child care. The Government of Canada has committed $400M for provincial/territorial child care systems in 2017/18 and $7B over 10 years starting in 2018/19. Manitoba’s share of the federal investment over the next 3 years will be around $15M annually, starting in 2017/18. Manitoba has not yet announced how they plan to invest the federal funds for child care. Along with an expansion of affordable and reliable licensed spaces, the child care plan must ensure parent fees remain affordable, care is of high quality and fosters early learning. It must include capital and operating funding, accessible and affordable province wide training for Early Childhood Educators along with a retention strategy that provides market competitive compensation, strong administration and governance. Child care is a very high priority for Manitobans, according to a MCCA/Probe Research poll, September 2016. Three in four surveyed agree a universal child care system, where every child who needs a space gets one, ought to be a priority of the new Progressive Conservative government. The shortage of licensed child care creates significant anxiety for families, worried they will not have a reliable space when they need it. A majority of Manitobans (58%) agree they are willing to pay a little more in taxes for a universal child care system. 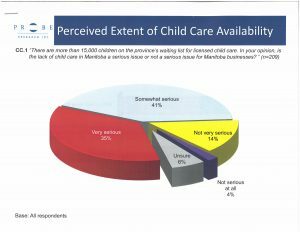 To evaluate public opinion on child care, MCCA hired Probe Research to design and conduct the province wide Omnibus poll via telephone interviews between September 13 and September 26, 2016 among a random and representative sampling of 1,000 adults residing in Manitoba. The results are within +/-3.1 percentage points of what they would have been if the entire adult population of Manitoba had been interviewed. MCCA has provided poll results to federal and provincial government leaders and policy makers to ensure they are aware of the need to develop a quality, affordable, reliable child care system that Manitoba families can count 0n. Nearly 3,100 parents who use child care participated in a Probe Research poll conducted for the Manitoba Child Care Association September 15 – October 1, 2016. Overwhelmingly, parents reported that the stress and anxiety of trying to find quality child care as the biggest problem. Two thirds (62%) of parents reported having to wait for a space, ranging between 14 – 15 months. A universal child care system would ensure every child who needs a licensed space gets one. The online survey sought to determine parent satisfaction with child care, the prevalence of wait times, gaps in service, experience and satisfaction with unlicensed home-based child care, key preferences and views on possible policy changes. It is the most in-depth opinion research undertaken in Manitoba on the issue of child care. There are approximately 34,000 licensed child care spaces in Manitoba, of which 91% of spaces are located in child care centres and 9% are located in licensed home child care. There is very little data regarding the number of unlicensed child care homes in Manitoba. Probe Research’s 15th annual Manitoba Business Leaders Index 2016 included questions about child care availability, impact of child care on employee absenteeism, and government policies to encourage workplace child care. There are almost 15,000 children on the province’s waiting list for licensed child care and 83% of Manitobans also say the lack of child care is a very serious (37%) or somewhat serious (46%) issue. 76% of Manitoba business leaders agree the child care shortage is a serious issue. Among respondents who favor some government role in child care, only one-quarter (24%) would likely take advantage of financial incentives were they offered. Almost half of business leaders (49%) report they have experienced difficulty finding skilled employees while Manitoba parents said child care wait times hinder their ability to work or attend school, with 41% delaying a return to work, 30% turning down a job, and 24% turning down an educational opportunity because they lacked child care. There is plenty of evidence from the public, from parents, and the business community to support a continued expansion of quality, reliable, accessible, and affordable child care services in Manitoba. The Manitoba Business Leaders Index included a stratified sampling of CEO’s, presidents, business owners and designated senior corporate officers from 200 small, mid-sized and large commercial establishments as defined by Statistics Canada and the Manitoba Bureau of Statistics. The survey results are considered accurate within plus or minus 6.9 per cent of what they would be had the entire population of Manitoba business leaders been surveyed.